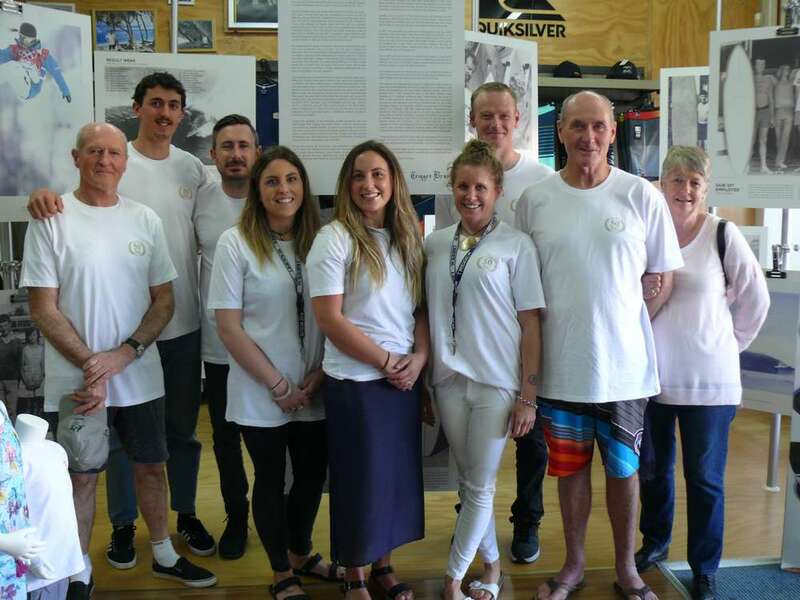 Check out some photos from the official opening day for Billabong at the Trigger Bros Sorrento store. We were really stoked with the Presentation they put together of our History. Many Thanks to David and all the crew at Billabong for making the day so special. 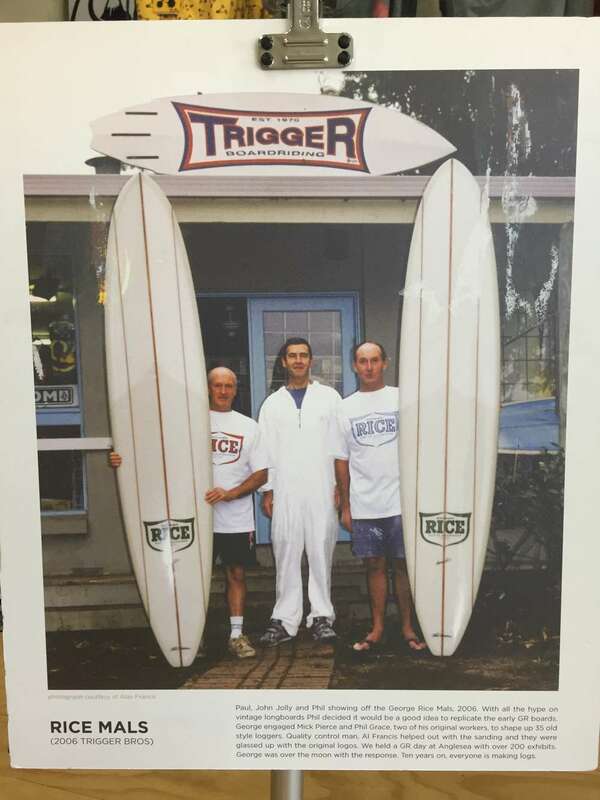 If you are interested in the History of Trigger Bros check out this article below. In 1968 Phil and I kicked off a hobby of making surfboards out of the necessity of not being left behind the pack as radical changes in length and design saw the sport rocketing towards the 70’s. Our first boards, like many others were primitive, but by the time 1971 came around Phil had the confidence to leave his job at Telecom and go full time and I joined him some 6 months later. 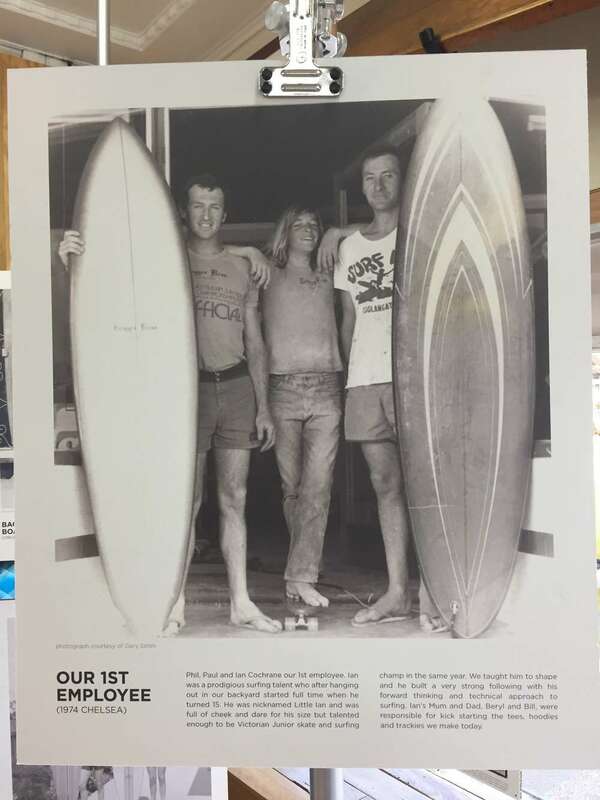 Such was our love of surfing that we were prepared to risk a solid 9 to 5 job and putting our heads down we had set up a regular customer base by 1972 with our first shop established at Nepean Hwy Chelsea. There was never any master plan, just a day to day love of making the boards, constantly experimenting with shapes designs and glassing techniques. 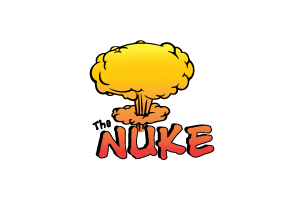 Any minor setbacks were quickly forgotten and we continued to move forward. We expanded the range to include a few tees, some wetties and our own produced Grip surf wax. 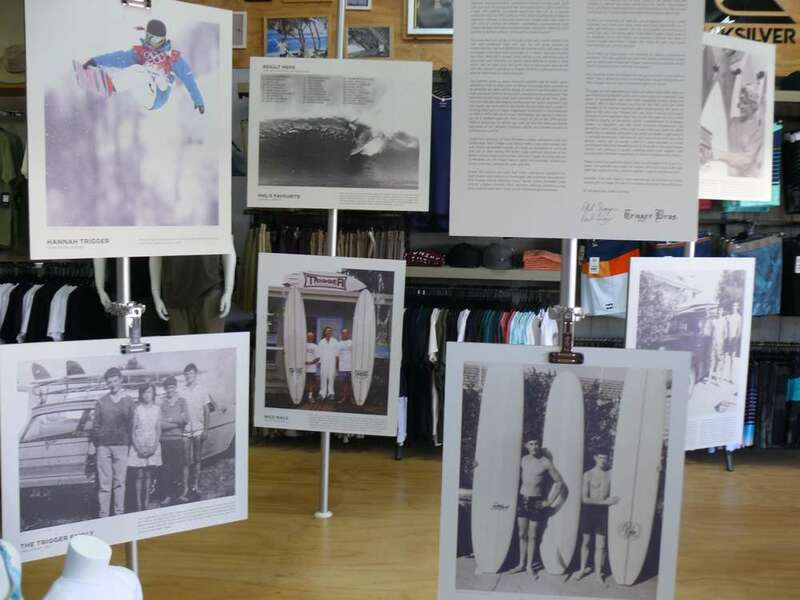 As the years slipped by Quiksilver, Rip Curl and Billabong demanded some rack space and so began a business that expanded to 5 stores. The essence was then, and still is today that Surfing is fun and keeps you fit physically and mentally. It’s much more difficult in today’s retail world but we both have the same love of the Ocean and we are still very proud to produce a Trigger surfboard that can give an individual so much pleasure. Our parents gave us some financial support and for many years offered to find us other jobs. In fact at one stage mum queried as to whether we were selling drugs, it seemed questionable to her that we could make a living from manufacturing surfboards. The bros by the way never got anywhere near drugs. 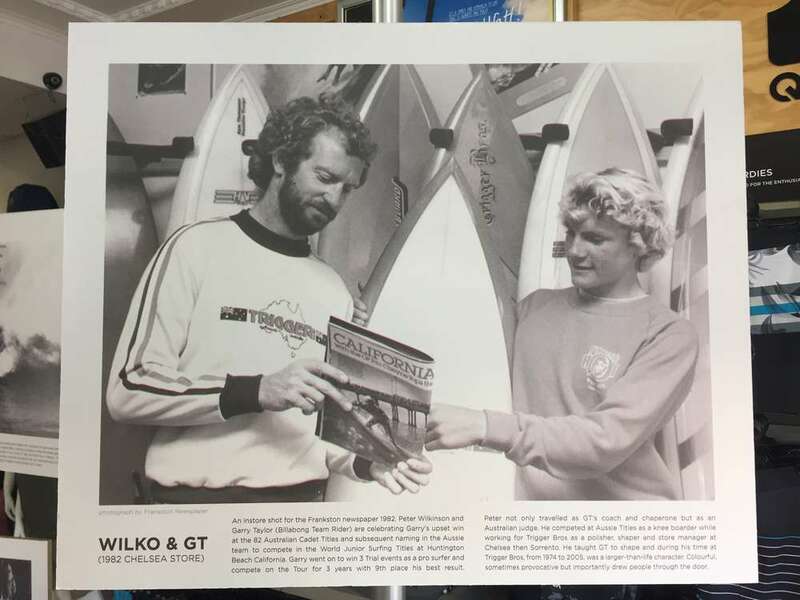 Any spare time we had was devoted to surfing and our purist approach was the reason we were able to dominate the Vic State surf rounds for so long. Paul was Vic Open Aggregate Champion in 1974 followed by Phil in 1975. We were never intimidated nor nervous and our go for it attitude paid off. 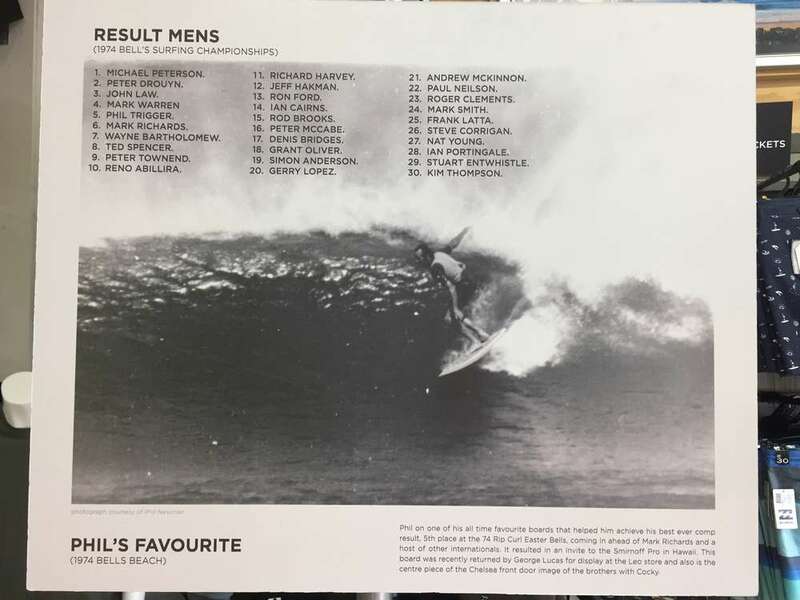 Phil’s result of 5th at the 1974 Easter bells is testimony to where we were at, but the ever increasing demands of our growing business stifled any further inroads to professional surfing. Single fins, twinnies, tri fins, thrusters, quads, Sailboards with Ted Bainbridge, Matt Trigger and Arthur Brett, a few kite boards and now Stand Up Paddle boards. 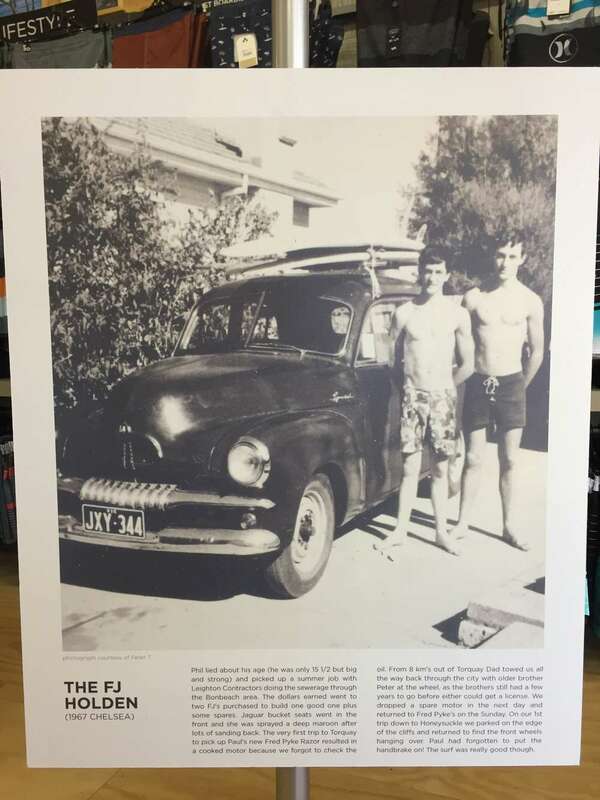 It’s been an evolution of surf craft that sees us now having the SUPS made offshore because of the Epoxy vacuum bag construction, but hey, Trigger Trackies and our Surfboards are still made here in good old Australia. Shaped by Simon and Paul Glassed by John and Phil. Along the journey we have had many champions represent us, Gail Couper, Alan Atkins, Ian Portingale, Ian Cochrane, Greg Brown, Phil Coates, Kenny Reimers, Garry Taylor, Simon Forward, Luke Fitcher, Andrew Everest, Mark Harrison and our present young guns cutting their teeth both on the peninsula and overseas. We have been assisted by long time employees in John Jolly, Peter Wilkinson and Alan Francis who have helped set a very high standard of quality and friendly service. 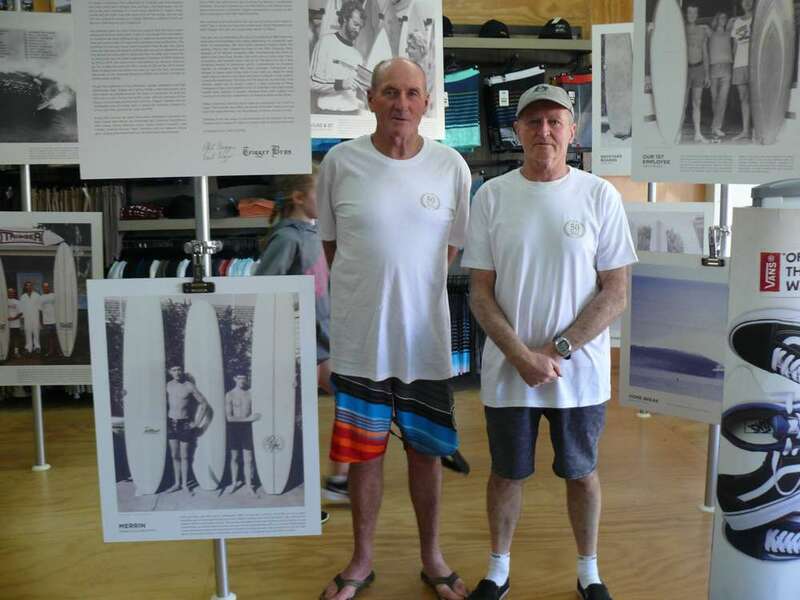 We have customers who ordered a surfboard from us in the late 60’s and also in 2014. Loyalty is very special to Phil and I now in our sixties and hopefully not wishing to offend too many others but the names Skip Easton, Prue Latchford, Melissa Harrison and Phil Newman are what we are talking about, friends that have been there forever and a day. 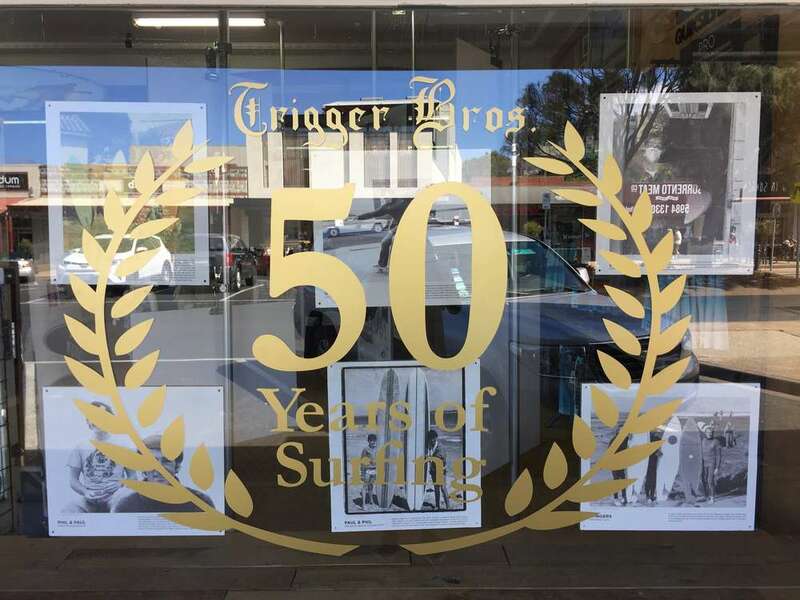 In 1997 we launched our website www.triggerbros.com.au which provides surf skate and snow news and importantly up to date surf and snow reports. The site now boasts some 19 live surf cams, the very first being taken from Matt Trigger’s push bike as he peddled up to the Pt. Leo lookout. Without the help of Darrel Foulds and Simon Trigger the other 18 cams may never have literally got off the ground. Since 1990 we have grown our business by taking a snowboard direction. This was initiated by Liam McCafferty and Shane Carter with an end result of Hannah Trigger representing Australia at the Sochi Olympics in the Half Pipe Discipline. Not wanting to be left behind we set up our Online store back in 2007. This is driven by long time employees Stuart Matthews and Matt Trigger who are very passionate about its future. This year we are celebrating 50 years of surfing from 1964 when we were hard nut footballers who were swept away by a relatively new sport of boardriding. We have both sustained injuries along the journey. Phil in fact missed the Final of the 1974 Vic Titles because of 13 stitches sustained after head-butting the shore at Bells in the Semi Final. Broken ribs and coccyx bones plus many lacerations and ligament tears but by far the worst for me is that terrifying feeling of drowning which I experienced at Gnaraloo Station on Ningaloo reef Nth West Australia. Tombstones has earned its name many times over. It can hold you down for what seems like an eternity and when one starts to breath in salt water it is mentally destroying. That was my 3rd wave on my first trip, I had already wiped out on waves 1 and 2. I have returned on three subsequent trips and sampled some of Australia’s very best waves (world class without a doubt) treating them with respect and buzzing from the fear I experience on those tombstone like drops. Today tomorrow and the future sees us averaging 4 to 5 surfs a week, the takeoffs are a little bit slower (Phil and I have both had right hip replacements) but the passion is still as strong as ever. Whether it be one wave or one manoeuvre, an onshore rip bowl shared with a couple of mates, or a classic day at our favourite spot. It’s all good fun.